None of the media have picked up on Vertonghen signing a contract extension yesterday, I am not being funny but why would a player sign a contract extension for another season knowing our club next season could be up in the air unless he got reassured from poch and the staff that they would be here next season. When our club was linked to Real Madrid and Chelsea in the summer, our players were signing contracts left right and centre , I am not talking about contract extensions for one year to see if Poch would be in charge but long term contracts, I am talking about kane and alli signing five and six year contracts. I am with paddy power with this one when Real madrid and Chelsea failed to lure Poch good luck Man utd but then again Ed woodward is so desperate and has more money then sense he would probably put a world record bid for a manager that gets Levy's money pants jiggling. Levy knows what to do, if he fails to back Poch this summer it just proves what some of us knows about Levy. He didn't sign a new contract the club had the option for an extra year. Would've been better all round if they had made it 2 years meaning stability all round and a pay rise for the player. The only way this effects the squad is if poch doesn’t tell them he’s staying ! They’d be well aware of situation before anyone else ! Pochettino has always been honest without shutting down the media rumours I suppose it’s in his interest to not in some ways as it strengthens him in negotiations with levy ! I’m not concerned at all at this stage I believe in poch’s previous comments he seems fully invested in us now& foreseeable future! He’s shown his loyalty & integrity in the past & will do so again imo ! some say its reassuring by poch,s non commitmtnt to make a comment, but i see it the other way, time to be wary, according to latest reports hes made it clear he now wants to be considered for the job. and carrick was never going to be temp manager in a million years. what concerns me is the playrs we,ve had who have "HAD THE DREAM" bebatov, carrick, keano, poch next? ps also dont forget united actually back their managers WITH CASH, more than levy does, food for thought. Andy Gray thinks Poch will be at Real madrid by summer and thinks Laurent blanc will get the Man utd job. Heard on talks***e this morning whether it's true I'm not sure but apparently levy refuses to do any kind of business with Utd unless we benefit . Still seething about the way berbatov left. Maybe in this kind of situation we will see the benefit of having a guy like levy at the helm. It's crazy to see the desperation of Manchester United. Everyone linked with the club, former players, pundits etc crying out for Pochettino to take over. Such is the state of the club. For a team that has been so dominant throughout the premiership (my entire life)and won so much to now find themselves 6th best in the league it is quite something to see. It is a club that now looks like it needs a rebuilding process. They have the finances, the stadium, the fans - They just need somebody to get a team playing good football. It's a good sign that all the top clubs are showing interest in Poch because it means that he is clearly doing something right. We cannot afford to lose him in the near future because I firmly believe he is the reason some of our players are staying. The next step is winning trophies to make him and the players want to stay! This is why I have been saying since the start of the season we should take every trophy seriously. We have won nothing for 11 years, its time to start winning something, anything. start with winning tonight. We beat the scum and we will win the league cup. Maybe true about still being peed off at the way Berbatov left , but Levy sanctioned the sale of Keane at the same time ! That, was unforgivable. Like the fact that he's playing a strong team. Surely that's a good sign that he's still focusing on us. They are better options out there then Eddie Howe, a european correspondent says Marco Rose of FC Red Bull Salzburg is a spitting image of poch he is achieving remarkable results with a small budget, they have not lost any competitive game so far this season, play in the same image as poch, high energy pressing passing football and shakhtar manager Paulo Fonseca who's team is known for there technical passing game. Eddie Howe as manager, that’s a joke for starters. I know, we have to start thinking like a big club and not go after managers who's teams are in mid table. I like how Eddie Howe's teams play football but against the big teams his teams always gets tonked and they do ship a lot of goals. he complained about not having enough money AT UNITED. No chance he'd work well with Levy. Plus I think football has moved past him, like it did Wenger. He needs to adapt. LOL Mourinho does not like youth set ups and young players because he does not no how to improve them, how can you improve a player if you never played the game. Mourinho likes already made stars while our team is not at its peak yet and he would want big spending money. I am not sure now he is a top manager any more because his tactics and ugly football is now outdated. NO! He has had his day. It would be really hard to replace pochettino because i would say he is the best in the prem right now given the resources backing him via levy. I am not going to advocate anyone taking his place but quite happy to suggest who could do a decent job as manager of spurs. Chris Hughton ! Arsene Wenger ! are a couple of names in the hat. Burnleys dyche style of play has been found out so he is on the reject list. Whoever replaces poch would be a step down. 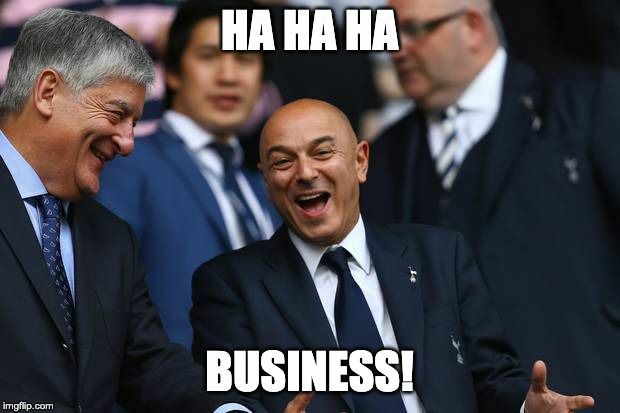 Levy has to ask man utd for nothing less than £100 mill for f***ing up spurs future because of the s*** that is going on there : otherwise its no deal. I couldnt give a s*** about man united but if they come calling levy has to strip them of mega bucks so they dont keep coming back. Why do they keep coming to us? I think the answer to that is the fact levy,s love of making big bucks. People know he can be hard to do business with as he always wants top dollar. He would flog his granny if the price was rignt. But havinf said that the trouble is people (players managers) hear united interested in them an straight away they get their heads turned, when will they realise that united are not the big club they once used to be. Leaving spurs now for united for me is a retrograde step for anyone, especially managers, but if poch is dithering id sooner he go now rather than have it hanging over us like damaclese sword. I hope if the worst happens Levy does not look at that list because they are mid table managers who at best would only achieve 5th place and a rare 4th place finish. They are managers who are forward thinking just like Poch out there, my choice is is Marco Rose from salzburg, plays the same type of football, youngish, tactical efficient , improves players and he is a winner, his team is unbeaten in every competition so far this season. I havent made a list scout ? just whats available of any consequence right now as options. I have no preferences i would big up to replace pochettino. Chris Hughton could possibly let us know what he has to offer with a bit of money to spend. My main point is that man utd need to learn that they cant afford us anymore. Poch's 5 year contract is worth £40 mill. His potential earnings for the club in the cl is at least £30 mill per qualifying season which we could potentially lose if he went to united. We are looking at £200 mill in return for tearing up his contract. Trust me levy will take this route.